It doesn't get much better than catching two of my favourite young musicians in one of my favourite venues, especially when a cold rain is tumbling down outside. If there's justice in the jazz world, pianist Marianne Trudel should be on the edge of a breakout. She is playing with confidence and creativity, and her compositions bristle with fresh ideas and a real sense of purpose. Check out her playing here, performing with trumpeter Ingrid Jensen at a show I caught last October at Quebec City's now-defunct Largo Resto-Bar. 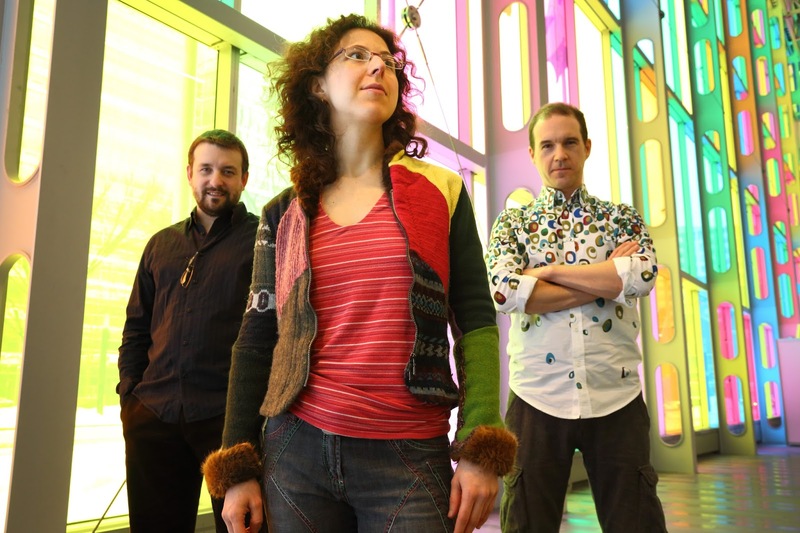 She brought her new trio—Trifolia—to the National Arts Centre's Fourth Stage on Friday evening, and delivered a highly charged performance that featured a handful of new pieces by herself and bassist Etienne Lafrance. It's music filled with interesting textures, largely due to percussionist Patrick Graham's distinctive set-up, which includes everything from plastic wind whistles to bowls of water. The bass percussion is delivered by a combination of hand drums and cajon, so it's a light, fluid sound that's constantly shifting. Trudel joked that Graham was known as the "Paganini of the tambourine," (better that than the "Pavarotti of the tambourine," suggested my buddy Peter Bunnett from the audience) but his dexterity with the instrument is serious stuff. More texture is added by Trudel's use of a small accordion, which she introduced with a touching story about finding it in her grandfather's basement. The band is finishing an extensive tour of Canada in mid-July. One can only hope that it finds a broader audience, too, because it is playing exceptional music that deserves to be widely heard. Another young woman whose early I've followed with interest is guitarist Mary Halvorson. Friday's performance with drummer Tomas Fujiwara's Hook-Up found her deep into a Sonny Sharrock mode, adding harsh, variegated bursts of feedback—along with her trademark octave bends and aggressive chording—to the band's strident sound. With trumpeter Jonathan Finlayson and tenor saxophonist Brian Settles up front, and the formidable Michael Formanek on bass, the quintet painted with bursts of sonic energy, Fujiwara displaying both power and grace. When proponents dig in on two sides of a debate, some key facts get lost. It follows that one of the things that was lost when bebop came to dominate jazz in the years following World War II was the primacy of jazz as social music. With its radical chord substitutions and lightning tempos, bop was music for close listening rather than dancing. By the time it reached the mainstream, bop was characterized as intellectual music, and many that aped the innovations of Charlie Parker, Thelonious Monk, Bud Powell, and Dizzy Gillespie ignored the fact that each of those musicians had deep roots in rhythmic music. When Louis Armstrong objected to the movement, battle lines were drawn, and the 'mouldy fig' epithet was thrown. In reality, the 'fig' designation was about as accurate as the belief that all boppers favoured berets and goatees. Those with longer vision see past these types of cultural reductions—many of which were imposed by popular media outlets. 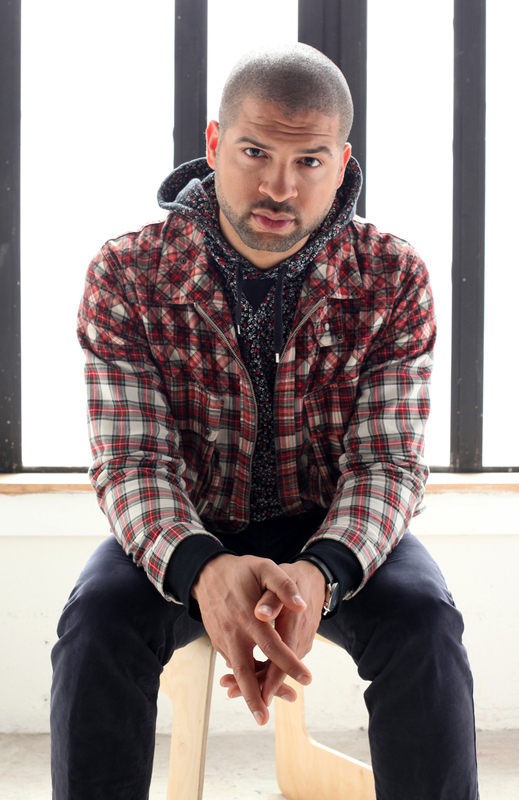 In the '70s, Henry Threadgill, David Murray and others looked back 50 years to some of the roots of African-American music in the 20th century, and now Jason Moran is mining the genius of Thomas (Fats) Waller to create a hybrid of social music that channels Waller's compositions through the lens of hip-hop. With longtime trio partner Tarus Mateen on bass and Meshell Ndegeocello as occasional bassist, poetess and onstage director, Moran brought his Fats Waller Dance Party to Ottawa's Dominion-Chalmers United Church for an early evening concert on June 27. On the previous Sunday, Mavis Staples had packed the church, so perhaps it was the mid-week timing that accounted for the small crowd that turned out. A number of those people fled during the first couple of songs—perhaps due to the way the sound of Moran's amplified quartet boomed through the large church, muffling the sound of singer Lisa Harris and deadening the effect of the rhythmic infrastructure. Things shifted sharply when Moran donned a large Waller mask—all bowler hat, raffish eyebrows, toothy grin, and cigarette—and the band kicked into Babatunde Olatunji's "Jin-Go-Lo-Ba" (better known to many music fans as "Jingo" in the form that Santana recorded it on its debut album). With the rhythm more elemental than the reinterpretations of Waller's stuttering tempos, some of the audience members jumped up to dance along. Moran also reminded listeners that he is, first and foremost, one of jazz's most gifted contemporary pianists, performing exceptional solo renditions of Waller's "A Handful Of Keys" and "Lulu's Back In Town." 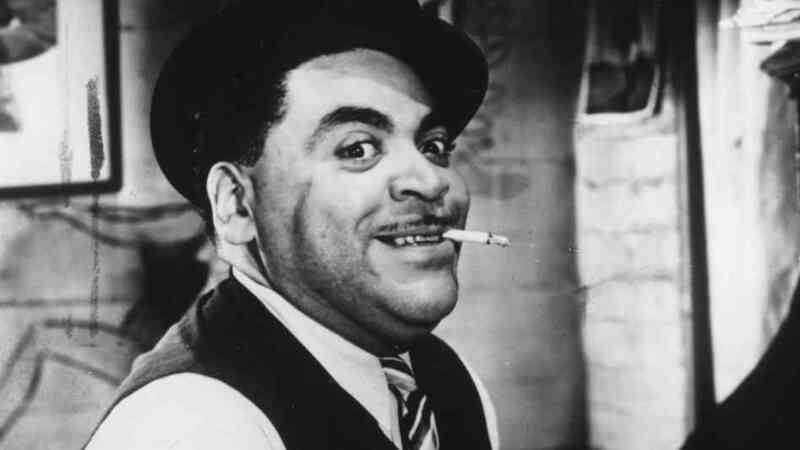 Although the band never really overcame the acoustics of the church (a closing "The Joint Is Jumping" lost much of its power in the mix) it succeeded in connecting the dots between what Waller set out in the '20s and '30s, his roots in the church, and contemporary rhythms. It is beyond cliché to say that jazz is akin to a conversation, and often not true. In many bands—especially during festival season, when travel woes are at their worst—musicians can be seen going about their work all but unaware of what their bandmates are doing. Some veterans seem to be particularly isolated. Twice during Wednesday evening's concert inside the National Arts Centre's Studio, 75-year-old pianist Steve Kuhn thanked the capacity audience for supporting "this music we have devoted our lives to." 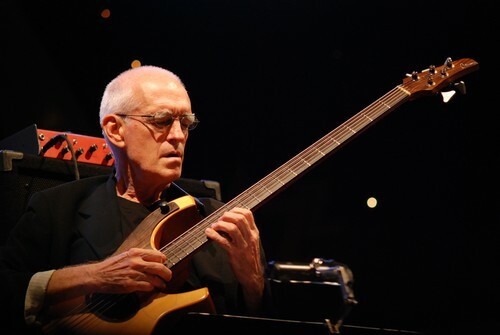 With irrepressible Joey Baron on drums and Steve Swallow on electric bass, the trio also seemed devoted to having fun. It's not unusual for Baron to have a smile on his face during a show, but he, Swallow and Kuhn continuously shared laughs and looks of appreciation at what the others were doing. For anyone new to the music, I recommend the sight of the grizzled, gnomish Swallow, hunched over his instrument and spinning out supple lines filled with gloriously round notes. The sound he achieves continues to be one of the most beautiful in jazz. Aside from Henry Mancini's "Slow Hot Wind" (also known as "Lujon") a slow, sensuous "Stella By Starlight" and an opening standard, the trio's program was divided between compositions by Swallow and Kuhn, including the bassist's gorgeous tune "Eiderdown." It is material they have often played, drawn largely from the four ECM albums they have made in some combination of the trio, but their enthusiasm and commitment to the moment ensured that everything sounded like they were making discoveries at each turn in the music. In Canada, the myth about top-rank musicians has long been that, once they relocate to Toronto, they become part of a homogenous whole, playing and recording music that all sounds the same. Tenor saxophonist Mike Murley literally blew that fable away with a stunning reinterpretation of the Irish war lament "Shule Aroon" that held echoes of John Coltrane's "Alabama," with drummer Ted Warren roiling behind him and bassist Jim Vivian strumming a pedal point darkly. Both Murley and Vivian moved to Toronto from Atlantic Canada (Murley from Nova Scotia, Vivian from Newfoundland and Labrador), and while they assimilated themselves into a group of musicians who have dominated jazz in Canada over the past 30 years, their Celtic roots are often on display. Murley's septet is strong at every position, particularly piano, with David Braid finding distinctive voicings and soloing beautifully. Outdoor concerts often hold the threat of inclement weather, and the Ottawa Jazz Festival has had more than its share of mainstage shows where weather played a factor: from the frigid rain that drenched a huge audience during a Wayne Shorter/Herbie Hancock show to a literally steamy field of grass that faced The Bad Plus one sultry Sunday afternoon. That said, no one in the media trailer—where a number of us took refuge from a hard downpour during David Byrne/St. Vincent—could recall a show being interrupted for 20 minutes to allow a lightning storm to abate. But, then, how many other festivals feature a headliner (singer Kellylee Evans) who was recently struck by lightning while standing in her kitchen? The memory of the 2011 stage collapse at Ottawa's Bluesfest during a Cheap Trick concert was also fresh in everyone's memory. The break didn't do anything to lessen the impact of what had gone before—more than 60 minutes of tightly arranged, hard rocking fun from the former Talking Heads frontman and 30-year-old Annie Clark, the compellingly oddball guitarist and singer from Oklahoma. Backed—and sometimes surrounded—by a New Orleans-style horn section, Byrne and Clark performed a strong mixture of songs from their joint album Love This Giant and other pieces, like Clark's "Cruel." Although many of the faithful braved the lightning and heavy rain, when the show resumed, its momentum had been sapped. What should've been an over-the-top encore (a much anticipated Talking Heads party song; in this instance "Burning Down The House") was somewhat anti-climactic. When the TD Ottawa Jazz Festival announced its lineup in late winter I dubbed it the Year of the Voice because of the number of highly distinctive singers who were featured: Willie Nelson, Mavis Staples, Aretha Franklin (who since cancelled), David Byrne, and Patricia Barber among them. I hadn't counted on discovering Monica Akihary, a Dutch vocalist of Austral-Asian heritage. Co-leading the quartet Boi Akih with guitarist Niels Brouwer, she covers a wide range, from soulful crooning on Bob Marley's "Redemption Song" to hyper-glottal wordless improvisation. Even better, her rich vocals are mirrored by the expressive playing of trombonist Wolter Wierbos, who delivered some memorable work on two Jimi Hendrix compositions: "Drifting" and a radically deconstructed "The Wind Cries Mary." Even though some of the band's equipment didn't arrive until midway through its performance, Akihary maintained the flow of the set and its sense of focused surprise. I doubt that festival programmer Petr Cancura knew there was a connection between Boi Akih and Chicago drummer Mike Reed's People, Places and Things, who followed the Dutch band into the National Arts Centre's Fourth Stage. If he did, then kudos for a canny booking decision; if not, then it was one of those lucky accidents that sometimes push festivals to a higher level. As it turns out, Reed's quartet—featuring the powerhouse bassist Jason Roebke and simpatico saxophonists Greg Ward and Tim Haldeman—has spent considerable time in Amsterdam, and recorded a forthcoming album with some of the leading Dutch improvisers, including Wierbos. The trombonist joined the band for a pair of pieces that illustrated his mastery of plunger mute, and his presence added a new dimension to a band whose incessant road work has made them a ferocious unit with unerring instincts for blending their voices. From the high intensity improvisation of Reed's band it was huge step to the late-night tent adjacent to Ottawa's city hall and the delightfully weightless voice of Aoife O'Donovan, the Celtic/bluegrass singer who seems on the verge of breaking through to a much larger audience. Best known by jazz fans for her contribution to trumpeter Dave Douglas' album Be Still, O'Donovan has the kind of gorgeous vocal instrument and effortless charm that Emmylou Harris displayed when she first moved from beneath the shadow of Gram Parsons. The tent was not the most favourable setting for her gentle voice (ironic, since the last time she performed in Ottawa—with the band Crooked Still—she, along with guitarist Richard Thompson, had been drowned out by Dweezil Zappa's over-amped tribute to his father) but her band was loud enough to cut through the incessant chatter of those reliving the night's Willie Nelson concert even if the lyrics of her new batch of songs were mostly lost in the din. 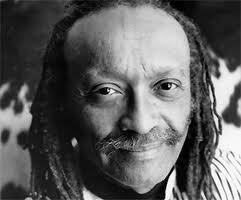 "One of the most original pianists in the history of free jazz, Mr. Cecil Taylor has developed his innovative improvisation departing from conventional idioms through distinctive musical constructions and percussive renditions, thereby opening new possibilities in jazz. His unsurpassed virtuosity and strong will inject an intense, vital force into his music, which has exerted a profound influence on a broad range of musical genres." I am hard pressed to think of a living artist who challenges me as much as Taylor, and who does so on so many levels. His music has brought me tremendous joy, and caused me to think hard. What more can you ask of an artist? I have written frequently of him here, beginning with this post. The Kyoto Prize brings with a cash award of some USD$500,000. As someone who has sometimes struggled to sustain himself as a creative artist working on the margins, no one deserves this kind of reward more than Taylor. 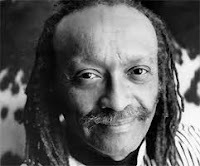 Quirky, confounding (especially if you've ever tried to book him) and justifiably demanding, Cecil Taylor is a treasure, and it is good to see him recognized while he is alive to enjoy it. Dr. John & The Nite Trippers – I came to Mac Rebennack's music courtesy of the late FM DJ Brian Murphy, around the time that the New Orleans singer and pianist was dressing in feathers and glitter and trading on the mystery of Louisiana folklore. In those years, Rebennack's band featured some of the young heavyweights of the Southern rock scene, and they did a great job at stirring up a stew of spacey sounds on songs like "I Walk On Gilded Splinters." Rebennack has moved in many directions since then, and lifestyle choices have not always made for the strongest music. But, like many other musicians his age, Rebennack has cleaned up and rejuvenated himself, and he's sounding better than he has in years. Mike Reed's People, Places & Things – A couple of years ago, at the annual Winter Jazzfest in New York City, the buzz among my fellow music critics was all about drummer Mike Reed. In part, this was because New Yorkers can't stand to be behind the curve, and they wanted to see if someone based in Chicago was as good as his advance rep. The other part was just how good Reed's rep is, and the fact that his band includes other promising young players. Reed is one of those drummers who break the stereotype; not only leading a band, but writing compelling compositions that reflect the music's heritage and help move it ahead. 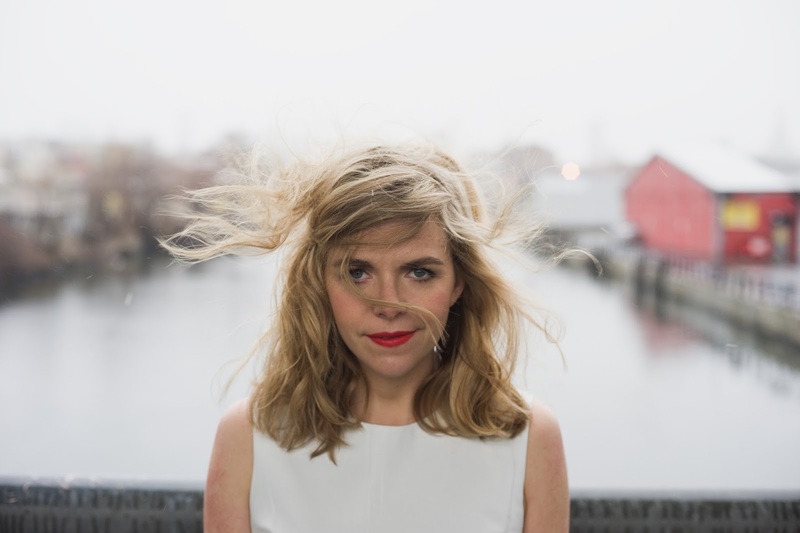 Aoife O'Donovan – Those who follow American roots music—particularly the strands that lean toward bluegrass and Celtic heritage—already knew about the power and suppleness of Aoife O'Donovan's gorgeous voice before she was selected by trumpeter Dave Douglas to join his band for his album of traditional hymns. I've since watched her perform her own music via NPR's video stream, and I'm looking forward to hearing more of her captivating material. O'Donovan has a deep well to draw on (she studied at the New England Conservatory of Music) and represents a broad cross-section of American music. Mike Murley Septet – There was a time when Canada's leading musicians—who, for the most part, live in Vancouver, Toronto or Montreal—could afford to take their bands to other parts of the country throughout the year. Thanks to cuts to government funding and rising transportation/accommodation costs, those days are gone, so this is a welcome opportunity to catch up with saxophonist Mike Murley and some of the other great mainstream players—including Kevin Turcotte, Jim Vivian, and Ted Warren—who live in Toronto. 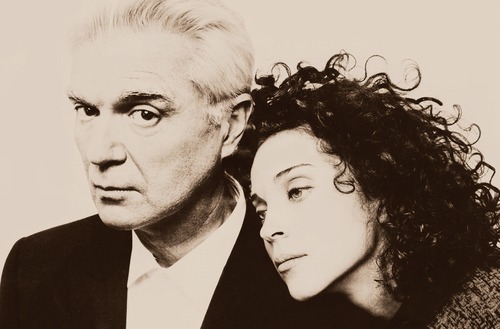 David Byrne & St. Vincent – Guitarist Annie Clark knocked me out the first time I heard her, and I've been a fan of Byrne's since the Talking Heads' debut album. Remarkably, I've never seen Byrne live, so I'm anticipating this show a lot. A free download of this band, which Byrne made available a few weeks ago, demonstrates that it combines the quirky rhythms that Byrne loves with a tremendous horn section. Joe Morris/William Parker/Charles Downs – I think I may have seen bassist William Parker perform more than any other musician in the past 20 years, but I never see enough of either him or guitarist Joe Morris. The great acoustics of the National Arts Centre's Fourth Stage should really make an intimate performance of close listening. Gilad Hekselman Trio – Another highly original guitarist, and another trio—featuring Marcus Gilmore and Joe Martin—that promises to push things into exciting places. I'm not sure how well this show will go over in the 'After Dark' tent, where audiences usually expect more pop-oriented shows, but I'll be happy to endure the likely grumbling and early exits. Steve Kuhn Trio with Steve Swallow & Joey Baron – Okay, life is full of difficult choices, but having to choose between two of my favourite Vancouver ensembles (the Peggy Lee Band and the Brad Turner Quartet) and the rhythm section of Steve Swallow and Joey Baron.... Well, this was a tough call, but Baron provided some of my most memorable moments last summer when he appeared in Ottawa with Sound Prints, the band co-led by Dave Douglas and Joe Lovano, and Swallow remains a master of the electric bass. Have to go with this one, as much as it pains me to miss Lee's double-guitar combination of Ron Samworth and Tony Wilson. Jason Moran's Fats Waller Dance Party featuring Meshell N'degeocello – I never pass up the opportunity to hear Jason Moran, and I've heard so many great things about his tribute to Fats Waller's social music that this is a definitely a must-see. The combination of the church setting and Moran's giant papier-mâché Waller head may well prove to be the most enduring image of the summer. Tomas Fujiwara & The Hook Up – Two words: Mary Halvorson. I've been singing her praises since first hearing her unique, octave-bending sound with Anthony Braxton. Fujiwara's writing is sharp and smart, and Halvorson is joined by some of her brightest peers, including trumpeter Jonathan Finlayson. The Bad Plus – The guys in the band readily admit that the first show they played in Ottawa—to a tiny crowd on a ridiculously humid Sunday afternoon—stands as the nadir of The Bad Plus' performing career, and they have subsequently tried to erase the memory of it every time they come to town. I expect no less once more. Always a great time, no matter what they pull out of their trick bag. Wayne Shorter Quartet – I equate my experience with this band, which I've seen both in grand concert halls and a Spanish basketball arena, to Miles Davis' post-retirement groups: I feel privileged to spend 90 minutes or so in the company of genius, and I'll happily go where the music takes me. Like Joey Baron, drummer Brian Blade never fails to provide memorable moments on the drums. 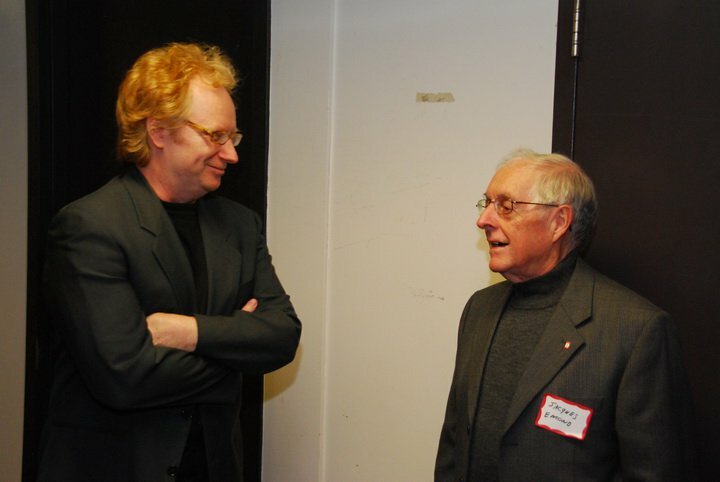 Vic Vogel & Le Jazz Big Band – I have a special connection to this show because I'll be introducing it, as part of a tribute to the late Jacques Emond (right, with me at a CKCU-FM reunion), the longtime programmer of the jazz festival who died last winter. Jacques was a knowledgeable big band aficionado and a dedicated supporter of Quebecois musicians. Vic Vogel is one of kings of Montreal's music scene, dating back to the early 1960s. Always filled with some of Quebec's finest session players, Vogel's big band is representative of the kind of jazz orchestras that populated Montreal's nightclubs when the city was recognized by musicians around the world as one of the swingingest places on earth. Jacques would be smiling at this one!